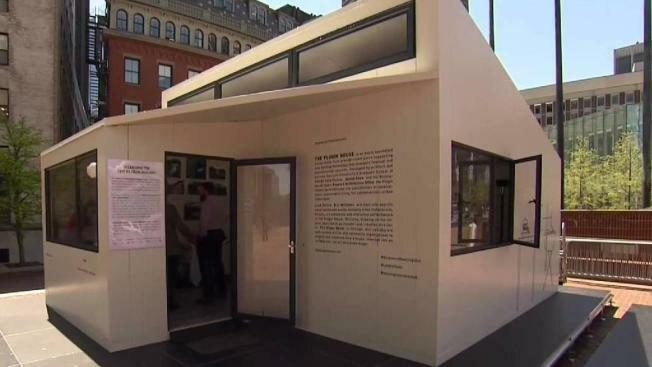 The PlugIn house will be on display at City Hall Plaza through Sunday, May 13. It is open for tours 11a.m. – 2 p.m. on weekdays and 2 p.m. – 8 p.m.on weekends. Amidst the tall buildings in downtown Boston, there is something small that could solve a big problem. This week is an open house for a tiny house that city officials want to know if residents would be open to building in their backyards. It is called the PlugIn house and the model unit is on display outside Boston City Hall. The 360-square-foot house is an example of energy efficient, low cost housing that the architect says can be built in creative spaces, including backyards. It also does not require any building skill to put together. A few volunteers helped build the one on City Hall Plaza in roughly five hours. With space at a premium and prices rising, the PlugIn house is just the latest strategy the Mayor’s Housing Innovation Lab is asking for feedback on as they look for ways to address Boston’s housing challenge. The backyard home trend is already catching on in other cities. Los Angeles recently approved 1,000 of them for the homeless and Shen has built some in China. Allowing the accessory dwelling units in Boston would require policy changes and right now city officials are only in the feedback stage. However, with 700,000 residents expected in Boston by the year 2030, they say it is time to start thinking out of the box, even if the box is only 360 square feet. The PlugIn house will be on display at City Hall Plaza through Sunday, May 13. It is open for tours 11a.m. – 2 p.m. on weekdays and 2 p.m. – 8 p.m. on weekends.